These five letters were written during the American Civil War by members of the Jewett family of Chelsea, Suffolk County, Massachusetts. Four of the letters were written by Dexter Jewett (1846-1913): one was written to his brother George Oliver Jewett (1837-1929), one was written to his father, Oliver Jewett (1805-1873), and the other two were written to his mother, Elizabeth Underwood Hubbard (1809-18xx). 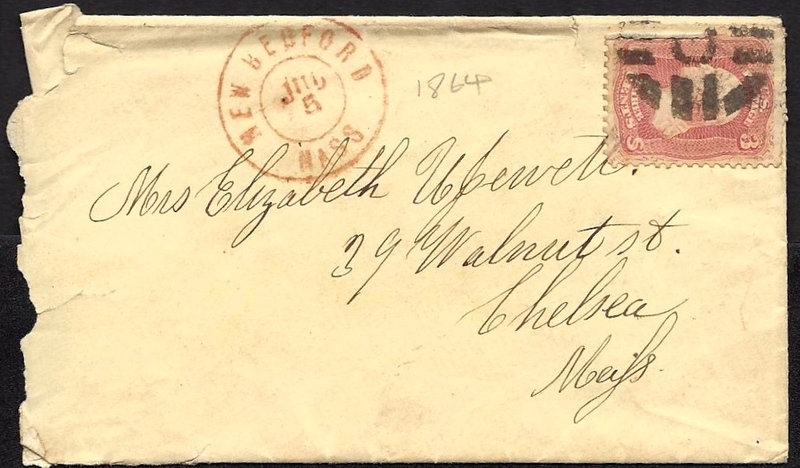 The fifth letter was written to Dexter by his mother. Dexter first served in the Massachusetts Militia from early May to early August 1864 and was garrisoned in the coastal defenses at Clark’s Point near New Bedford. Dexter later joined Company G, 13th Maine (in September 1864) and transferred to Company H, 30th Maine in January 1865, mustering out in June. The Jewett’s resided in the rear of 124 Pearl Street in Chelsea. Dexter’s older brother George was a sergeant in Company D, 17th Massachusetts, and later transferred to the Veteran Reserve Corps in February 1864 before mustering out in May 1865. Dexter’s other brother, William Mellow Jewett (1842-1910) also served in the Union army during the civil war. He was a member of Company H, 1st Massachusetts, at the outbreak of the war and later re-enlisted in the 42nd Massachusetts. I have received your kind letter and I was pleased to receive it. Mother making a box to send to you and I thought I would drop a few lines to you. We had a letter from William last week and he said that he did not know where they were (but the letter was dated Port Royal). except that they were on the ocean. They have had quite a fight at Murfreesboro, Tennessee [Battle of Stone River] and Gen. Rosecrans has licked Gen. Bragg almost out of his boots. Our loss was 1000 killed and about 5000 wounded. There has been another fight at Vicksburg, Mississippi and they say we have taken it. I suppose you know Tony Pollo ¹ was killed at those fights down your way. I hope you will excuse my writing such a short letter for I am in a hurry to put it in the box as it is waiting for me so good bye. ¹ Antonio F. Pollo (1842-1862) served in Company C, 44th Massachusetts Infantry. He was killed in action on 16 December 1862 during the Battle of Whitehall (or White Hall Ferry) in North Carolina. I hope you will excuse my not writing to you before but we have been doing rather heavy patrol duty in the night time and have to have a little sleep during the day after cleaning our guns. There are some persons come round here nights and stone the sentinels and we can’t find who they are after all our hunting after them and we extend our posts way to New Bedford to find them. If we ever catch them, it will go hard with them as we have our guns loaded. We were paid off last Saturday and received $18.66 and I send you ten dollars as a present to you. I would send you more but you see yesterday was Fourth of July and we were about all of us down in New Bedford in the afternoon. We had quite a nice dinner in the barracks which came from the city for which we paid a dollar each and then we had fifty dollars worth of fireworks which was raised by subscription. The next pay day, which will be before long, I will send most of the money. We had a splendid Fourth yesterday. In the morning and at noon, we fired a national salute, and in the afternoon we had passes to the city. In all, it was the best Fourth I ever spent. In the evening we had pleaded fireworks and they went off gay and there was fifty dollars gone off. I received your box and I was very glad to get it. It come Saturday night — just in time for Sunday and the Fourth. The pineapple went gay with the sugar. The pickles were all right and also everything else. And I am much obliged to you and I hope you will take pay out of the money I send home. You would have got this before and more of it if the letter had not been mislaid. I carried into the Sergt.’s for a gentleman to take up for me with fifteen dollars in it and he went off and forgot to take it with him. I would like to have father come down here to see a feller and it would look a little like home to see him or some of the rest of you. I don’t know but what I shall try for a pass to Chelsea after all as I don’t know about us boys getting out of this so easy at the end of three months. However, I had just as leave stay here longer as it is a bully place to be at. I must close now as it is almost time for guard mounting. So good bye. ¹ The fort at Clark’s Point near New Bedford was part of the network of coastal defenses in the state. By the summer of 1863, the fort contained ten casement-mounted guns. The fort’s first tier was finished by 1864. I hasten to inform you that I have just received your money. If you are still at Camp Barny, I wish you would inform Major Rollins as your father wrote to him to ascertain what express you sent it by. We did not know whether you had left a note. I am glad for your sake that it is safe for probably if you had kept it by you, it would [have] been stolen from you. Whenever you send, be particular to let us know in what way you send it. Your Aunt Mary and Lizzy with Willy spent the day with us yesterday. Lizzy wrote you a letter. You must answer it. Decky, I want to know when [you] arrive at the Island. I want to send you a box. Will you let me know what things you are most in need of. I want to see you very much and if it is possible to get a pass, we shall do it. Dexter, I want you you to tell me if you are in a good regiment and what kind of company you are in. Also the names of your officers, your Captain, and the letter of your company so that I may know how to direct to you. I had a letter from [your brother] George last week. He said he saw an C_____ street the day you left. I wish you would tell us how you came to go to Portland to enlist. Let me know all the particulars, will you? I received your letter and likeness by Mr. Tenney. Your likeness is both excellent and I look at them very often. They will comfort me in your absence. I have called at Mr. Tenney a number of times and they have very kindly called on me to give all the information they could. I thought your likeness looked as [though] you are well. I thought your last likeness looked as though you was not well. I shall send you some Cartima Mixture when I have got a chance to see a box. Have you been troubled with the dysentary since you have been gone? I fear very much you will be troubled with it when you are gone South. Now, my dear boy, I hope you will pray to God to protect you from all evil. Do so my son, and remember that your mother’s prayers shall be offered at the throne of Grace for your eternal welfare. We think of moving to Boston where we can get a good house. It will be much better for to be where your business is. You know I have never liked Chelsea and it is very expensive area. None since ___ has been raised. I hope we shall hear from you often. When you send money or anything, you had better direct to your father’s shop and be particular about it. We got here yesterday morning and will stay here two or three days probably. I am going into the 13th Maine as a volunteer. There is a transport waiting to take a battalion of the 61st Massachusetts to Washington. I wish you would send my overcoat to me as we did not draw any overcoats and will you just tell Mrs. Tenney that Lyman would like his [too]. You could send them together. When we stopped in Boston yesterday, I tried to get a pass to go to Chelsea to see you but the captain could not grant any passes. It was not in his power to do so. The Island here is a tip top place. They do things right up in shape. I have sent two pictures to you. What do you think of them? I think they are bully one, don’t you? I wish you would get father to get me a pair of blanket straps as we have none dealt to us and send them with the overcoats and send them as soon as possible for I need them badly. They are pretty strict here and make a fellow toe the mark but if a fellow behaves himself, he will get along tip top and fare well. We drew pretty good shirts and drawers but I would like to have some more shirts and stockings if you can get them. I have bought a good pair of boots and vest and some other things. Lyman has gone as a substitute and ain’t certain that he will go with me. I shall have to close so goodbye. From your son, — Dexter Jewett. Direct to Dexter Jewett, Gallop’s Island, Boston Harbor, Massachusetts. Barracks 19. ¹ Gallop’s Island was the site of a training camp and a mustering out camp (for discharging soldiers from service) for Union soldiers. It held a wide assortment of buildings including; twenty barracks — each having a cook house; six sets of officers quarters; one headquarters building; a commissary; a storehouse; stables; hospital; main guard house and a wharf based guard-shack; an “old house” with associated officer’s dining room; two shore-side/piling raised sinks; one land based privy; four wells; a church; and a library. We have been on quite a little march this week and got back _______ night and started on Monday morning. We reached to what is called Ashby’s Gap — about fifteen miles from here — where there is a ford to cross the Shenandoah River but owing to the rain, it was too high and we had to march to Snicker’s Gap where there is another ford which is about fifteen miles from Ashby’s Gap on what is called the Berryville Pike. But as the Major in command of us did not know the way through the woods, we got lost and put up for the night at a place about four miles from the Berryville Pike and the way the boys killed hens, pigs, and geese was a caution. The next morning we started and got to Snicker’s Gap about nine o’clock and there we halted for about an hour but we could not get across the river there either for it was too high at the time so we had nothing else to do but just turn round and come back home again, and I tell you the boys were sorry for there we were in sight of some of their pickets but could not get a shot at them. We arrived in camp Tuesday night and the most of us were pretty well played. I received four papers from home Tuesday night and the reason why I did not get two of them before was because they were directed to the 13th Maine and probably they could not make out where that regiment was so at last they sent it to me. I had a letter from Layman Tenney ¹ yesterday and he was at Wilmington, North Carolina and having a gay time of it. There were sixteen of our scouts taken prisoner just a little way outside our pickets yesterday by the guerrillas. Has George got home yet or is not his time out? Well, I have not got only six months more to serve lacking six days when I will be out of this show. I suppose business is pretty brisk now, is it not, as spring is just opening. How many workmen have you got to work for you now? I shall have to close now so good bye for the present. I have not seen your picture yet. ¹ Pvt. 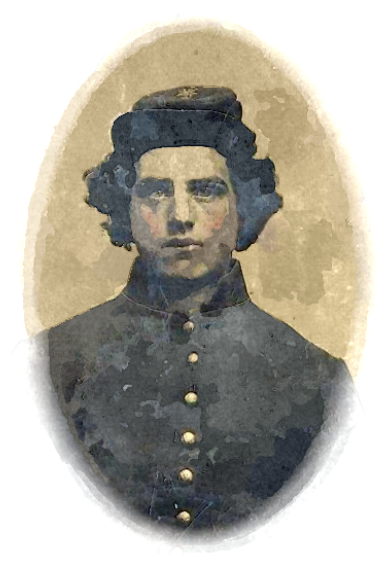 Lyman B. Tenney (1843-1912) enlisted on 29 September 1864 as a substitute to Company D, 9th Maine Infantry. The 9th Maine participated in the capture of Wilmington, North Carolina, on 22 February 1865. After the war, Lyman returned to Chelsea, Maine. This entry was posted on Friday, August 22nd, 2014 at 11:25 am	and posted in Uncategorized. You can follow any responses to this entry through the RSS 2.0 feed.